you and your cat happy." The right cat litter box is essential for your cat's good health (and for protecting your home!). Just like humans, felines have certain likes and dislikes in this area. You may need to experiment to see what makes your cat happy (and "regular"!). Your cat's happiness and preference in this matter are sure to make you happy, as well. Neglecting any one of these areas may lead to your cat taking his business elsewhere! A litter box can generally be classified as either "covered" or "open." The covered litter box (one with a hood that covers the bottom pan) has advantages for both you and your cat or kitten. If your cat is "shy," then a cat litter box cover may help encourage her to use it. The benefits to you of a covered litter box include a more aesthetically pleasing look and less mess, as the litter is more likely to stay in the box when your cat covers his waste. On the down side, some cats find these types of boxes too confining and unappealing. Your cat may feel trapped and vulnerable. She may not like having only one escape route if startled by a loud noise or if another animal approaches. The covered type may also be too small for some cats to feel comfortable, so be sure to get a covered litter box that's big enough based on your kitty's size. And although many covered boxes come with a replaceable charcoal filter on the hood to help reduce odor, covered cat litter boxes do tend to hold more odor if not cleaned regularly. Many kitties find the odor too unappealing to enter the box. However, if you clean your cat's litter box often, you should be able to avoid an odor problem. If you want a covered pan that is even more aesthetically pleasing, you can find decorative covers to blend in with your decor. An open cat litter box allows your cat to keep an eye on her surroundings as she takes a bathroom break. The open box will most likely mean more clean-up for you as many cats tend to kick some of the litter outside of the box as they cover their waste. You can avoid a little bit of the mess by using an open litter pan with a high back wall. This will catch most of the litter. You can keep a whisk broom and dust pan handy to make clean-up a bit easier. Which Does Your Cat Prefer? Many cats will have a preference for what type of box they use. Most cats will use the cleanest box available. If possible, put out both a covered and an open cat litter box and see which one your cat prefers. Giving your cat her preferred litter box will be beneficial to both you and your cat (and maybe even your carpet!). Cat litter boxes also come in different sizes. If you have more than one cat, you should probably consider more than one litter box (if your cats don't get along for some reason, this is a must!). If you plan to use only one litter box, then consider buying one of the larger boxes, especially if you aren't around to clean the box frequently. If you are buying a litter box for a kitten, be careful that the sides are not too high so the little guy won't have any trouble getting in and out. There are some great self-cleaning boxes on the market. These can make your life a lot easier. However, you may want to approach their use as an experiment and not count on your cat thinking they are as great as you do. They are usually a little more expensive, so try to buy from a company that has a money-back guarantee. If she likes it, great. If not, don't insist on its use, or your cat may take her business elsewhere. Plastic cat litter box liners can be used to help make your clean-up process easier. Theoretically, you can lift the liner out of the box, along with the used litter, and throw the whole thing away. This helps preserve the life of the box and makes cleaning easier. One problem, though, is that your cat's claws are usually pretty sharp and she may tear through the plastic liner. This makes clean-up even more difficult. And some cats just don't like the feel of the plastic on their claws. This can be disastrous if your cat decides to take her business elsewhere. If you choose to try a liner, be sure to choose the right size cat litter pan liner, and place it correctly and smoothly in the box. Correct placement will help prevent folds from occurring that can trap waste and lead to a smelly litter box. Proper placement may also prevent your cat's frustration from getting her nails caught while trying to cover her waste. Place your cat's litter box in a location that is easily and always accessible to your cat. It should not be too close to your cat's eating or sleeping areas. Make sure that the cat litter box is in a location where your cat will not be interrupted or surprised by another animal, human, or sudden loud noises. If your cat feels stressed and unsafe when using the litter box, she will choose another place more suitable to her liking, but not necessarily yours. If you have a large house or more than one floor, it's a good idea to have more than one cat litter box (one on each floor). This is especially important if you have an older cat who may find it hard to get around. 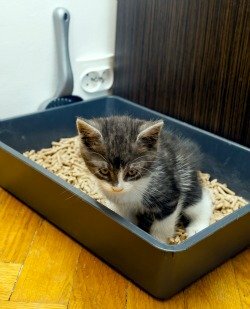 Not only is the location of the litter box an important choice for your cat, but it should be for you also. You will be more likely to keep the litter box clean if it's someplace that's easy for you go get to. Keeping your litter box cleaning supplies nearby will also help you to keep your cat's litter box clean. Cats prefer to use a clean cat litter box. If it's not up to par, don't be surprised if your cat takes his business elsewhere. See my Cleaning a Litter Box article for easy cleaning steps and the supplies you'll need. A word about "flushable" cat litter is in order. I strongly recommend that you do not actually flush the litter in your toilet. Some plumbing just can't handle it, and even in sturdier toilets, parts of the litter will often stick to the insides of your toilet and not flush. Instead, put the soiled litter in a small, covered trash can lined with a plastic bag, or you can use zip lock bags and dispose of them when they're full. You can also buy a litter disposal system to keep the soiled litter relatively odor-free while it's still in your home. Getting off on the right foot in this area will make life better for you and your feline friend. Take a look at my Litter Box Training page for suggestions for "house training" your new adult feline friend, or my Kitten Litter Box Training page for potty-training your new kitten. Note: Consult your veterinarian immediately if your cat has always used her litter pan with no problems, and all of a sudden she stops using it. Of course, this recommendation assumes you have made no changes to the routine (e.g., different type of litter, or changed the location). PETsMART offers tons of cat litters, as well as all your other litter box needs. They also provide lots of useful information about litter box choices and getting your cat to use the litter box. Amazon is also a good choice for all your standard litter box needs. CatsPlay offers an extensive selection of "litter box furniture" to make this area of your house a little prettier. Cat Supplies - Here's a list and information about essential cat supplies.